Like your favorite local grocery store, with its sushi bar, fresh baked goods, and maybe a very obliging butcher, Best Food Writing offers a bounty of everything in one place. For seventeen years, Holly Hughes has delved into piles of magazines and newspapers, scanned endless websites and blogs, and foraged through bookstores to provide a robust mix of what's up in the world of food writing. 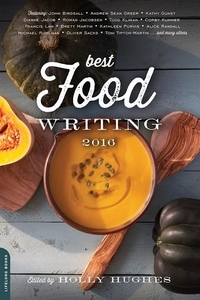 From the year's hottest trends (this year: meal kits and extreme dining) to the realities of everyday meals and home cooks (with kids, without; special occasions and every day) to highlighting those chefs whose magic is best spun in their own kitchens, these essays once again skillfully, deliciously evoke what's on our minds-and our plates. Pull up a chair.